Last year’s disastrous bushfires in Victoria may only be a warning to dangerous times ahead based on the current warnings from various Australian Fire Authorities. To ensure that Davey customers have the opportunity to buy the high selling engine driven high pressure pumps, the Davey Firefighter, Davey Water Products have increased production at their Scoresby plant in Melbourne. A forecast of a dangerous fire year from across the country should be the only warning home and landowners need to take action now. Recognising the risks to come in summer Davey Water Products has commenced the seasonal fill of its dealer and retail chain with its Davey Firefighter engine powered pumps, and have placed additional orders for stocks of engines so they are able to build completed pump ready to fill the needs of consumers. Davey spokesman Ashley White says “we have developed quite sophisticated market forecasting and production planning techniques to ensure our Firefighter supplies are adequate. “While many land holders in rural, country and outer metropolitan areas recognise that a well maintained and reliable engine powered fire pump is a key component of their fire prevention resource as well as fulfilling general water transfer duties, many landholders are still not prepared to plan ahead. Davey offers several choices in its Firefighter engine powered pump range including either petrol engine or diesel powered versions. 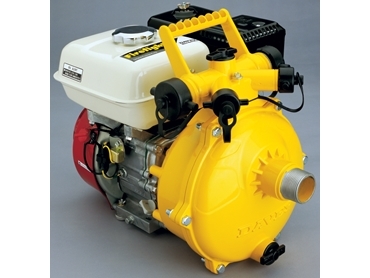 The most popular are Firefighters available with either Briggs & Stratton or Honda four stroke engines. “This season we are working closely with Honda as one of their preferred OEM customers and Davey is participating in the Honda green and gold promotion to signify that a high quality engine is matched with an Australian made wet end. “The cost of a Davey Firefighter pump set plus the necessary inlet and outlet hoses which are readily available is only a few hundred dollars and for most property owners in high bushfire risk areas represents both a good investment and insurance protection” Mr White says.